Click on any picture above, to view the video (3.9 mb)! 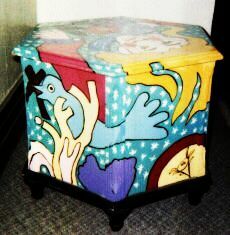 I found this lovely hand-painted cabinet on the sidewalk outside my apartment building, April 2002. I think--for the first time in my life--that I now own a bonafide "objet d'art". Probably a period piece from the late 60's/early 70's; definitely is "hippie funk" with a clear influence of Peter Max and Zap Comix. Perhaps a young woman painted it for her child, who brought her great joy. 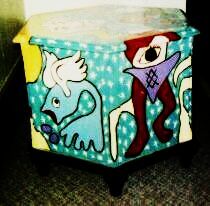 Maybe the cabinet was used to store children's toys. At any rate, the painting emanates happiness in a "faerye magickal" British Isles sort of way. Often, deities come to me unbidden...some I've never heard of before; thus I study them in order to learn more, after their first visit. An example would be the sudden apparition of Odin, even though I have never felt inspired to meditate on any of the Nordic spirits...my preference being Celtic/pre-Celtic, Native American, and Greek myth. Likewise did Manannan suddenly come to me unbidden, out of the blue mist! It all started one week ago, when I was curious about your "manannan.com" website promoted via a pagan newsgroup. As I viewed the home page, his apparition began telling me wonderful things, and showing me some secrets about the world. His presence remained quite strong for several days. And it was on the third day since his first visit, that a gift fell into my hands, that was clearly from Manannan. (I live on San Francisco's busy Market St., in the Castro.) A few doors down from where I live, I came upon a lovely, hand-painted cabinet that was just sitting there on the sidewalk, under the brilliant light of afternoon sun. It was so colorful and jewel-like, this hexagonal box, that it seemed like some magical manifestation of the fourth dimension, happily radiating its power like a radioactive aura. Passersby all paused to admire the curious objet d'arte, as it really stood out to delight the eye. I stood by it, so folks would think I owned this piece of furniture, as I waited myself, to see if someone was just moving, or had really disposed of it. After five minutes of waiting, I hauled it back home. It is hexagonal in shape, thus suggesting the Star of David...with a door on one of its six sides, and was hand-painted like an artist's canvas all around and on top. The cabinet is empty, just a slick black interior. The painted background is sea-green in color, with little twinkly stars reflecting the sky. On the sides are painted sort of fantasy underwater scenes: winged fish swimming through coral; and some big, froggy type thingy with one eye (in the hippie style of Zap Comix). Indeed, the whole style is very Peter Max. On the cabinet top is the face of a man with thick, flowing blond hair, looking up at you as if rising up out of the water. He has rouged cheeks and a little other clown-type makeup, that suggest an illusionist or minstrel, rather than a modern-day clown. A large blue bowtie and a red sleeve with purple cuff completes the impression of a magician or clown. He is presenting to you, two large, lush flowers, one red, one purple. But I first didn't relate this cabinet to Manannan until hours later...when I realized that the background was not earth or sky, but sea. And it also didn't dawn on me til later, that Manannan Mac Lir is indeed a magician. 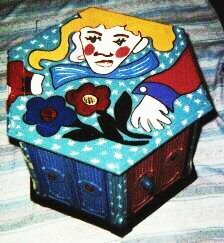 I originally brought it home, just because it was so charming and unusual, thus captivating. The realization that it is a depiction of Manannan Mac Lir didn't sink in till later that evening, when I thought "Oh my God!" Now whaddaya all think of that? Myself, I am stunned and incredibly delighted...and honored. Manannan is indeed a most benevolent gift-giver, and joyful, kind spirit...who I never knew about until last week. Then, suddenly, he's all over me, showering me with affection, and manifesting also as my missing or deceased lover, Randolph, who has disappered from my life way back in 1991. But that's another story, I'll save for later. Suffice it to say that Randy manifests often to me in visions, over many years...usually as Zeus, sometimes Horus, and of course as himself. He never before wore the visage of Manannan (if that is the right way to put it), but Randolph is pure Celt: half Scot and half Irish.